You are currently browsing the tag archive for the ‘wasp’s nest’ tag. my dad has been collecting wasp’s nests for me for the past couple of years and i just happened upon them again a couple of weeks ago. you want to keep them in a plastic bag or glass jar for a good year or so after you “harvest” them, which is why i forgot about them (i didn’t do that with the first batch about three years ago and couldn’t figure out why there were wasps in my studio the following spring!). usually, nine times out of ten, i find perished wasps in the bottom of the baggies or jars after letting them sit. anyway, these were ready and i decided to start a couple of pieces with them. this one is called “wasp’s gift”. click on any of the images to view enlarged versions, if desired. at the top of this piece is an X. in the elder futhark, that rune is called gebo, which literally translates to “gift”. so, not a terribly creative name, really, but befitting none the less. (more specifically, gebo means gifts, both in the sense of sacrifice and of generosity, indicating balance. all matters in relation to exchanges.) the circles represent gestation and external growth. 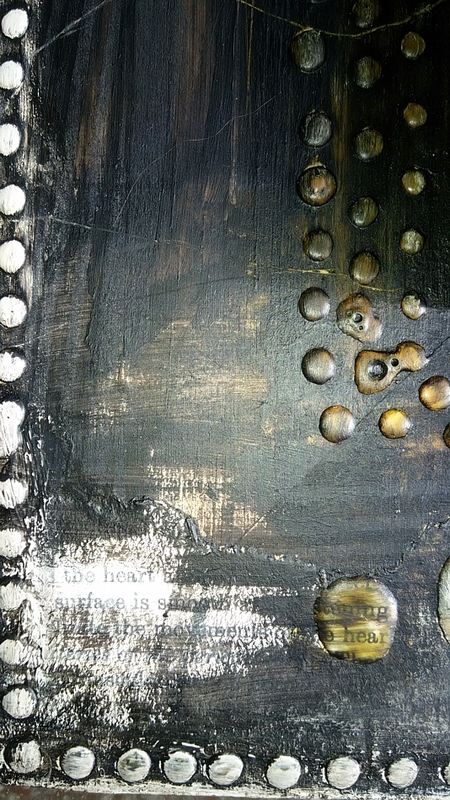 the dots and markings on this piece are very textural and not just painted on. you can see peeks of vintage and antique book pages sticking through in a couple of places. 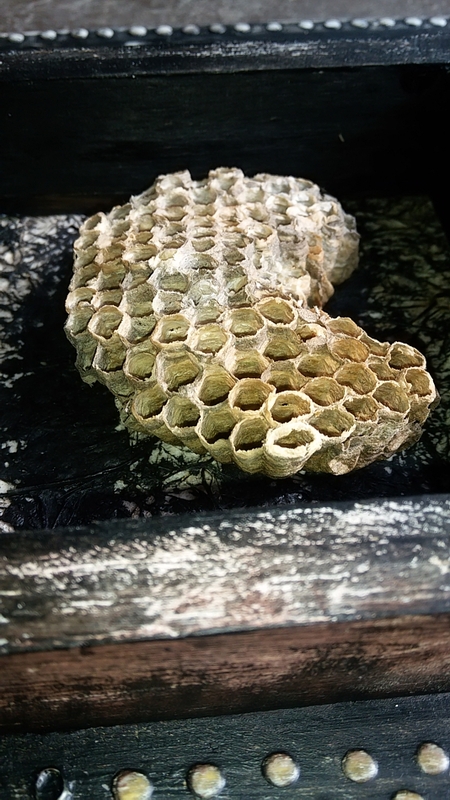 the wooden “frame” around the wasp nest protrudes from the wooden base. the first photo didn’t make that entirely obvious. 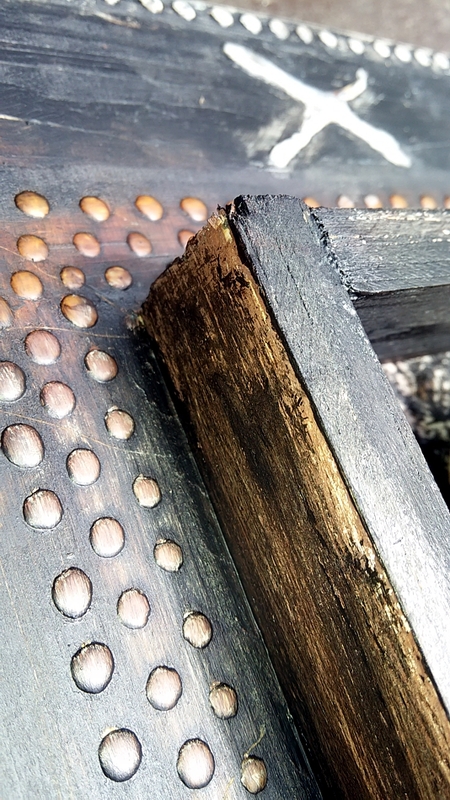 it was intentionally cut and assembled roughly to give it a more ancient or primitive look. here’s a little close-up of the crescent shaped wasp nest. i loved that nest the most out of my entire collection so was excited to use it here. 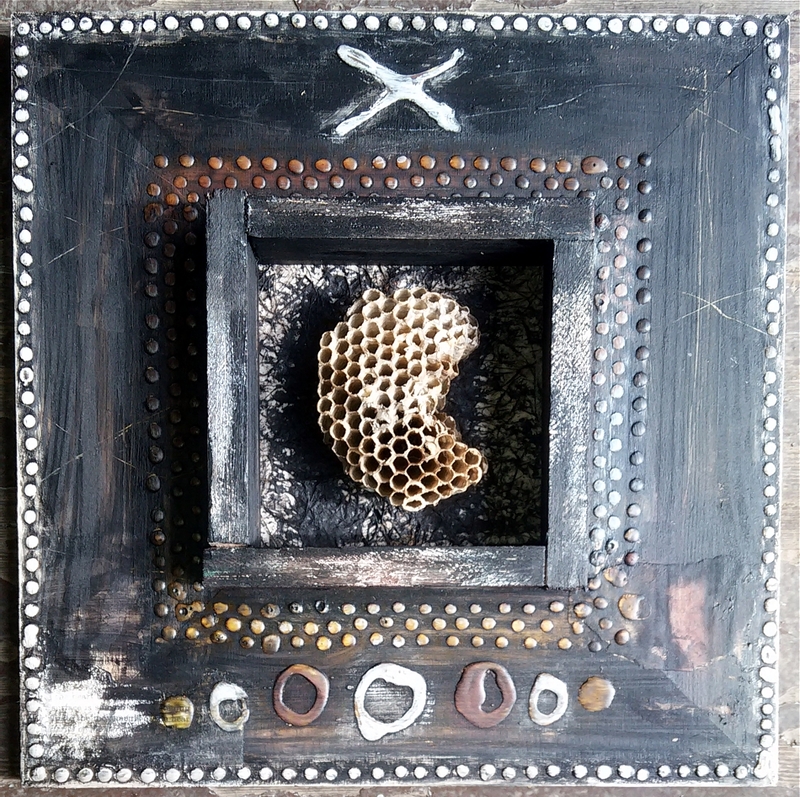 “in some african traditions, the wasp is a symbol of evolution, and control over our life circumstances. some native american indian tribal myths indicate the wasp was the creator of the earth, and was a symbol of order, organization and productivity. this piece has been imbued with healing earth energy and the gift of protection for whomever’s home it ends up residing in.